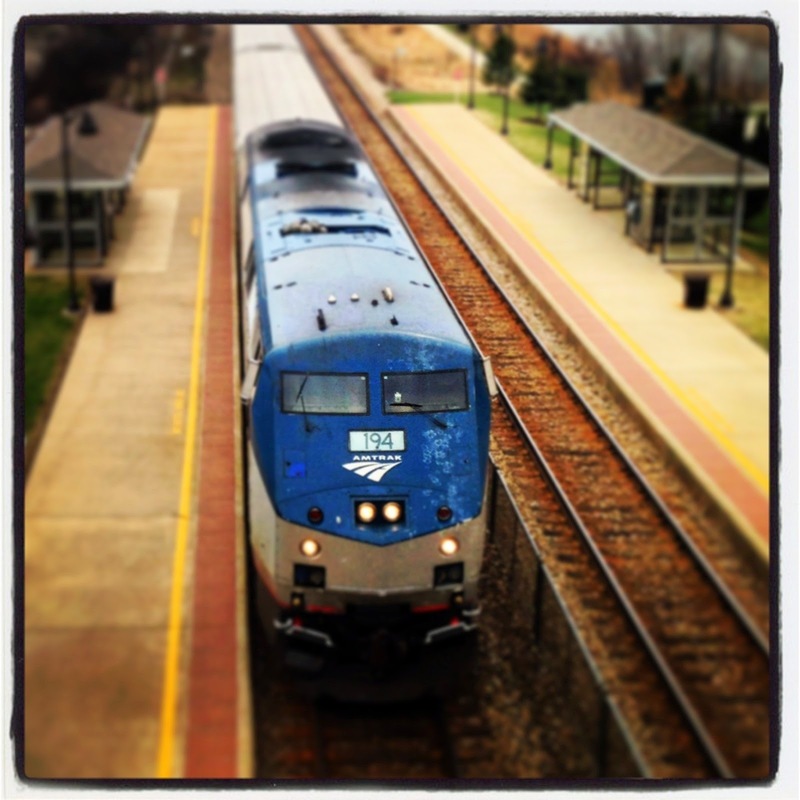 This Easter holiday - Isabella and I decided to ride the Amtrak train to my Mom's for the holiday. It was Isa's first train trip. My last train ride was on a Yukon train in Alaska. So this was a totally new experience for both of us. Our trip started when we boarded in Sturtevant, WI. A local train depot about 8 miles from Isa's house. It is a new station with no employees only computer ticket sales only. Our train was headed to Union Station Chicago IL. 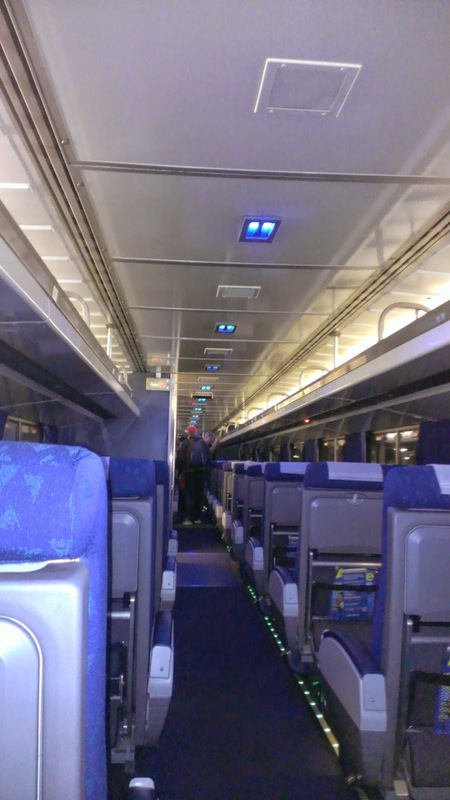 When we got on board the train was full. We kept walking the cars to find two seats together....finally on the last car we got our seats. The train made only one stop before we arrived at Union Station. Union Station Chicago! Oh My Goodness! It was busy. We arrived in Union Station right at the beginning of rush hour! People EVERYWHERE! Some running - but the majority were power walking at a very fast speed. Since Isa and I had no clue where we were going - we were taking it slow ready signs! We laughed and said...we know we have tourist written on our foreheads! Since we had about a 1 1/2 layover we decided to get us some food. 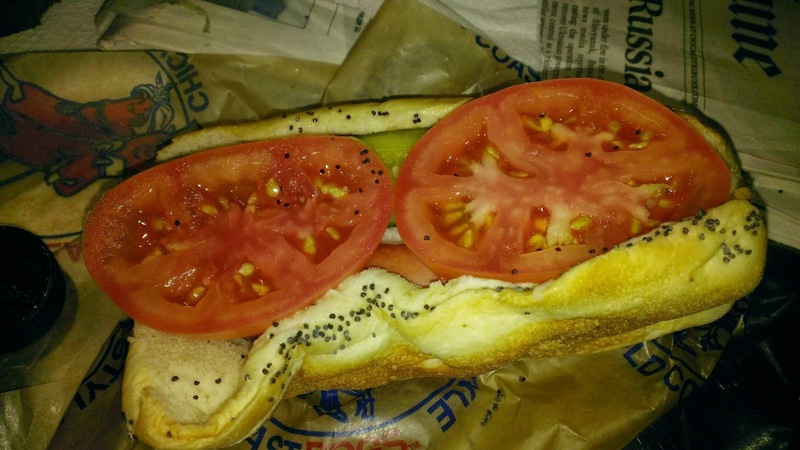 Chicago Hot Dogs were on our list. We both got a very tasty hot dog at the food court. Next was the donuts! 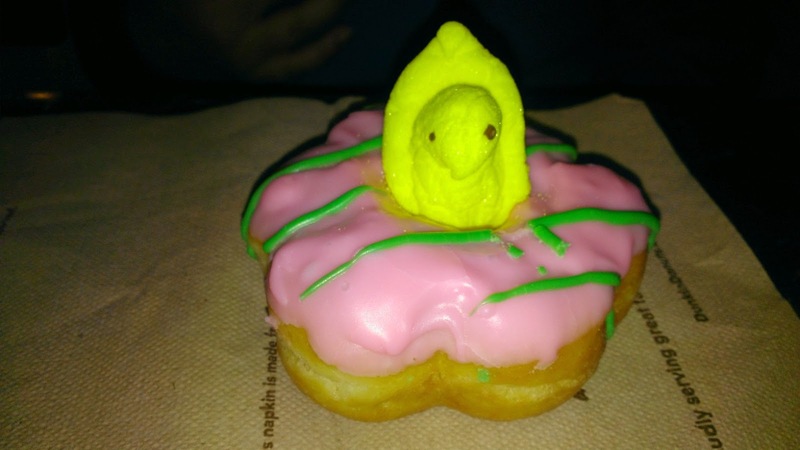 Isa wanted the Peep donut. She said it was delicious. After people watching for a while - we figured it was time to head to the area where our train will be departing. Once there the area was packed. We found two seats and settled in till they announced boarding. When we boarded our train to Toledo we were very pleased with our assigned seats. No rushing to find a seat. Isa was really happy we were on a double deck train and we were on the top. The train was very very nice. 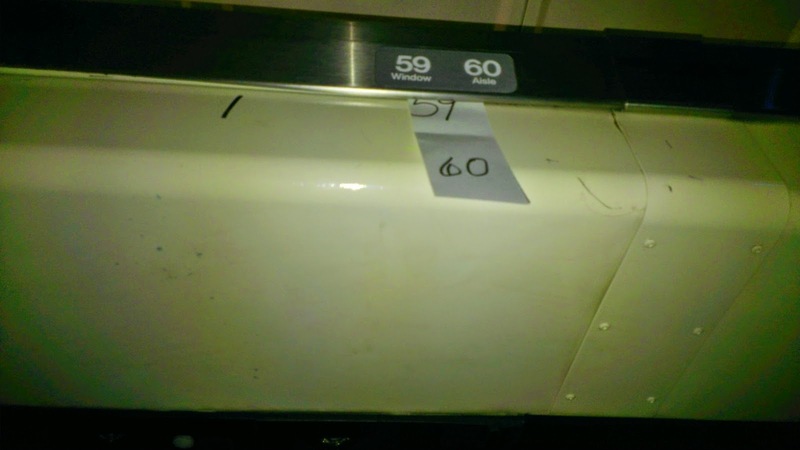 We learned to take out numbers the conductor gave us and place them by our seat number. This tells others that these seats are taken. Once the train started we were asked if we would like to dine in the diner car. We said "Yes"! Our reservations were for 8pm. 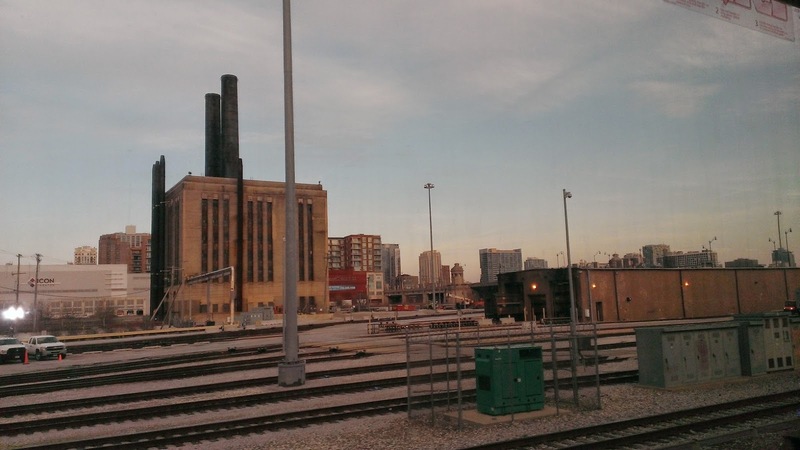 We enjoyed our ride through Chicago with very interesting sites that you see from a train! nice couple from Madison. They were headed to Washington DC for a long weekend. The food was delicious! 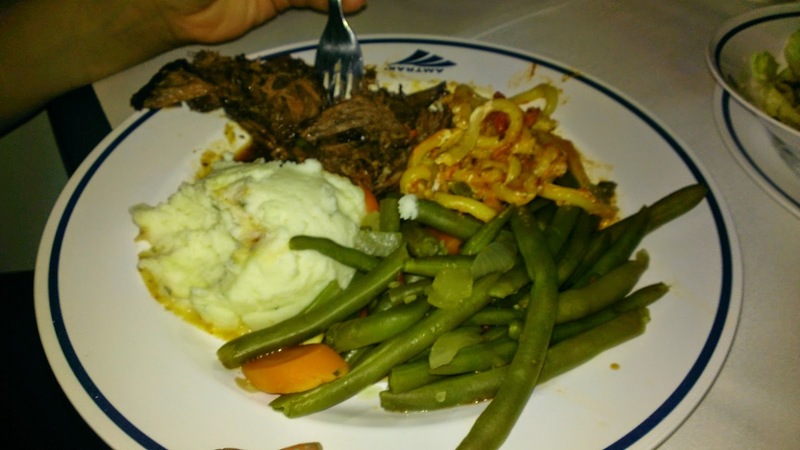 We had such a good time dining that when we got back to our seats we were shocked that we were gone for 2 hours. Good food and good company made for a excellent meal. Back in our seats with full tummies. Isa and I both nodded off! Isa was snoring and I was in the twilight mood. Before we knew it we arrived in Toledo. Train was a little late - we left Chicago late so we were expecting to arrive late. At my Mom's we had a very fun holiday. Family from Pennsylvania and my family from Michigan - we made a fun group. Time flies when I visit my Mom - before I knew it we were heading back home. Our return train was leaving Toledo at 6:15am. My brother picked us up and dropped us off before he went to work. We sat waiting for our train...no train. Then we hear the announce. The drawbridge for the Maumee River went up for a freight ship and would not go down! DELAY! It winded up being a 2 hour delay! We get on our train....right away Isa and I notice that this train is not quite the quality of our trip here train -nice just older. We had been planning our breakfast in the dining car. To our surprize no dining car on this train! NOT GOOD - we had not eaten breakfast! So we headed to the snack car to buy a snack. We left with coffee, juice and a muffin. We get to Gary, Indiana and we stopped. They were doing work on the tracks! Another delay - thank goodness for our 4 hour layover that was planned. We were going to need every minute of it to catch our next train. Once we got into Union Station - Isa and I took off to get on our next train. We were moving FAST! We made it to the line to board! WOW!!! That was close. While in line a lady was complaining so...I just wanted to tell her to "Please Shut Up"!!! Lady we are all RUSHED! Instead I coached Isa on "How NOT to be." It was a good lesson for Isa...she saw what we went through and we were not complaining - then she sees this lady complaining so much...even Isa said she wanted to tell her STOP! We get on the train - great seats - our trip is almost over! Our next stop is HOME! When we exit the train we see Davey running to us - just like the commercials! He missed his big sister! Missed her BAD!!! 7 days as a only child did him in! Now to plan our next train trip between Christmas and New Years. This time we are going to Ann Arbor, Michigan. That train is a shuttle that is always on time. Well at least they say it is! Overall we rate our train trip 5 stars! Perfect time...we had a excellent time!!! 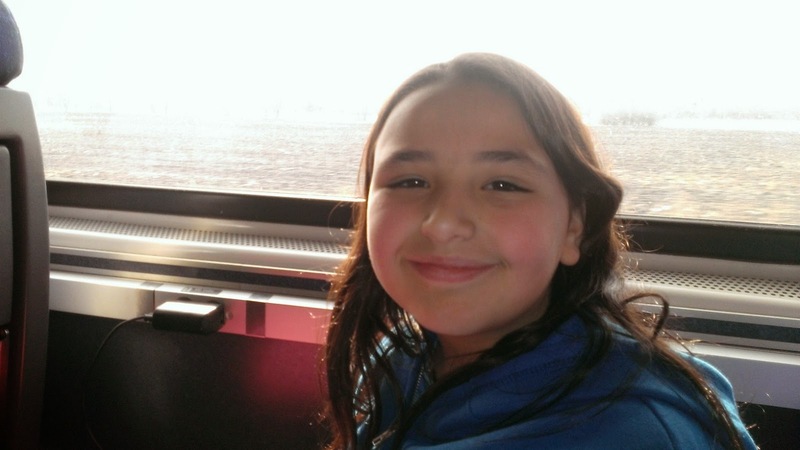 Thanks Amtrak for a priceless memory for Isa and I! I have been traveling to my Mom's for Easter for over 25 years. I have driven and flown. Since taking this train trip - I have to say - the train is now my way to travel there! Easy - Fast - Inexpensive. I could not drive for the cost of the train tickets. Sure we had a couple delays - but nothing like delays I have had on planes! Not to mention Chicago traffic jam delays!